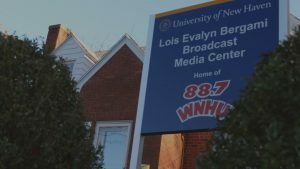 WNHU was founded as a student club in 1970 by a group of students from the the University of New Haven’s school of engineering: They took advantage of an FCC policy that granted space on the left side of the FM dial to non commercial entities for educational purposes. In 1973, WNHU went on the air (in mono), broadcasting from studios that were designed and built by students. The station started broadcasting in stereo in 1978, kicking things off with The Who’s “Tommy”. The WNHU studios moved from the second floor of the student center (now Bartels Hall) to the basement of Maxcy Hall in the early eighties, and arrived at our current home on Ruden Street in 2015. 1. Provide a vibrant campus extra-curricular activity, where students can express themselves and form friendships based on a shared love of radio (and now, podcast) media creation. 2. Provide a platform for student learning by integrating radio and podcast production into the University’s curriculum. 3. Offer opportunities for student employment in an environment that parallels that of a professional station. 4. Enable students — and members of our surrounding communities — to express themselves on the air without the constraints imposed by financially-driven commercial stations. The radio station is supported by the University and it’s department of Communication, Film and Media Studies — and by alumni, area businesses, and individual gifts from our listeners.